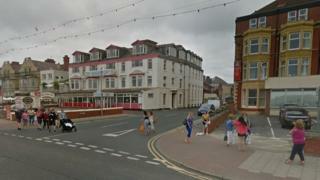 A teenage boy has been charged after a 13-year-old was stabbed close to Blackpool Promenade. The boy was stabbed in the chest on Rawcliffe Street, opposite the town's beach at about 17:50 GMT on Saturday. Lancashire Police said his injuries were not thought to be life-threatening and he remains stable in hospital. A 14-year-old boy has been charged with wounding and possession of a knife and is due to appear at Blackpool Youth Court later. A 13-year-old girl and a 15-year-old boy, both from Blackpool, were arrested on suspicion of affray over the attack and have since been released under investigation.